The 5 ossa metatarsalia form the bony basis of the middle foot (metatarsus). Between the bones lie the Intermetatarsal spaces. The base of the metatarsal has a wedge-like basic shape. Its concave cartilage surfaces articulate with the tarsal bones and together they make up as a unit the tarsometatarsal joint. 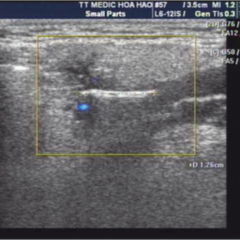 The shaft possesses a triangular cross section, whereby the tip points toward plantar. The plantar bone margin is curved and concave in the longitudinal direction, the dorsal surface is straight to slightly convex. The head has a convex wedge-shaped cartilage surface that stretches over on the plantar side toward proximal. On either side of the head, there is a small tubercle, to which on each side respectively the collateral ligaments of the metatarsophalangeal joint are fixed. The first metatarsal (os metatarsale I) is the shortest and most powerful metatarsal. Its larger cross section is required due to the increased biomechanical stress generated by the rolling motion of the big toe. The second metatarsal (os metatarsale II) is the longest metatarsal. Going laterally the length diminishes with each subsequent metatarsal. The initially cartilaginous metatarsals during the 2nd and 3rd fetal months acquire in the region of ​​the corpus perichondral bone cuffs. In addition, there is a epiphyseal bone base structure present with each. In terms of ossification the similarity to the middle hand is distinctly noticeable: the first metatarsal at its base has an epiphyseal ossification centre. 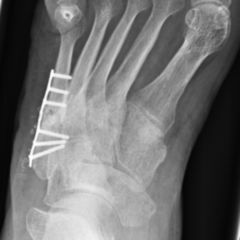 The remaining metatarsals each have this in the caput. The epiphyseal endochondral bone depositions first appear at age two to four years. In rare cases, one can find an additional, second epiphyseal deposition in the first and fifth metatarsals. 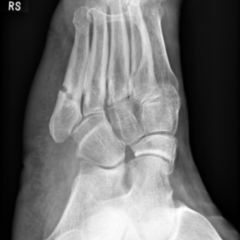 Despite the numerous ligament structures that connect them to one another, the metatarsals are allowed to move slightly away against one other. The light spreading and fanning capacity enables formability of the forefoot, which comes into action in the pronation and the supination positions and allows better compensation for unevenness of the ground surface.